DIY bathtub refinishing kits often peel! 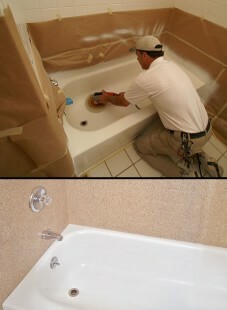 Bathtub Refinishing - Do It Yourself? Thinking about refinishing your own bathtub? 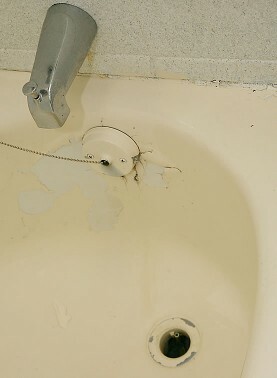 Bathtub refinishing is not the best project to Do it Yourself! A good refinishing job on a bathtub should be very glossy, smooth to the touch, and have a uniform appearance just like a new bathtub. You will never be able to duplicate the glossy finish and feel professional refinishing gives your bathtub, sink or countertops with a do-it-yourself bathtub refinishing kit! Ask yourself...Would you repaint your own car? Refinishing involves many of the same skills and materials used by professional auto body craftsmen. When you consider that 25% of all work performed by Miracle Method is redoing someone else’s attempt to refinish a bathtub, you should think twice before using a DIY bathtub refinishing kit on your bathtub. DIY refinishing kits cannot match professional application! Bathtub Refinishing - Do It Yourself? A good bathtub refinishing job requires extensive preparation, use of special cleaners, bonding primers, fillers for cracks and chips, and the skill and experience to spray on fast drying acrylic coatings. You will not get good results from a porcelain repair kit or bathtub refinishing kit, nor will you get the warranted durability a Miracle Method refinisher offers. Using a two-step cleaning process to remove soap scum, body oil, and dirt. The use of MM-4, a safe non-acid bonding agent, to assure the new coating will last. Two to three coats of high tech acrylic urethane sprayed on to assure an even surface. Buffing and polishing to deepen the gloss and create a like-new porcelain feel. A nearly 30-year reputation for quality backed by a five-year adhesion guarantee. Hire Miracle Method & get professional results with a guarantee! Bathtub Refinishing - Do It Yourself? 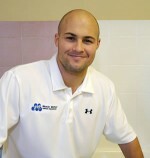 Do you need to talk to a professional bathtub refinisher? If you want to learn why you shouldn’t consider bathtub refinishing as a DIY project click on Find a Location or call our toll free locator number, 1-888-271-7690 to reach the nearest Miracle Method professional.